On Friday, April 1st, three actors from the American Shakespeare Center arrived on campus to lead a workshop for Middleburg Academy students entitled "Directing Shakespeare." Drama Teacher David Sturdevant was instrumental in bringing the workshop to the school. "As part of our focus on STEAM, it is important to have these kinds of events on campus," he said. "The creative and critical thinking skills that theatre develops is something that all our students can benefit from." 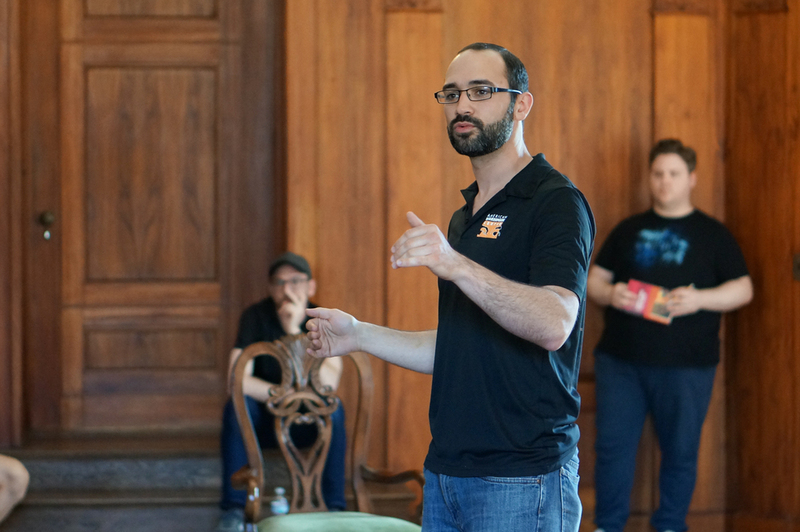 The workshop demonstrated the principles used in the rehearsal room and performance spaces of the American Shakespeare Center (ASC), including embedded stage directions, pronoun choices, character address, and audience contact. The hands-on workshop allowed the students to make artistic choices based on their new knowledge and then direct the ASC actors in a scene from their repertory. The actors were in town for the annual Shakespeare in the 'Burg event and were just coming to the end of their national tour, performing Henry V, Julius Caesar ,and The Importance of Being Earnest in rolling repertory. The actors amazed the students with a hysterical scene from "The Importance of Being Earnest." Equally amazing was their ability to take specific directorial suggestions from the students and immediately incorporate them into the performance. The workshop was attended by over 35 students and faculty from all walks of the Middleburg Academy community. Some of the actors from our upcoming spring production of "Fools" were in attendance and learned several pointers that they could transfer to their performances. "We hope to make this an annual event at Middleburg Academy," said Sturdevant.